If you are constantly finding yourself in the tempting yet dangerous head space of comparing yourself to others, you are not alone. Comparing ourselves to others is a natural way for us to evaluate ourselves and can be used as an opportunity for growth. While it can be used as motivation it is often taken too far and leads individuals down a dangerous rabbit hole of self-doubt and insecurity. With social media being such a presence in our lives today it is easier now more than ever to compare ourselves to not only those we interact with, but anyone in the world that we desire. In order to protect your self-esteem and self-worth make sure you are taking the proper measures to stop the comparisons before they go too far and begin to affect your mental health. 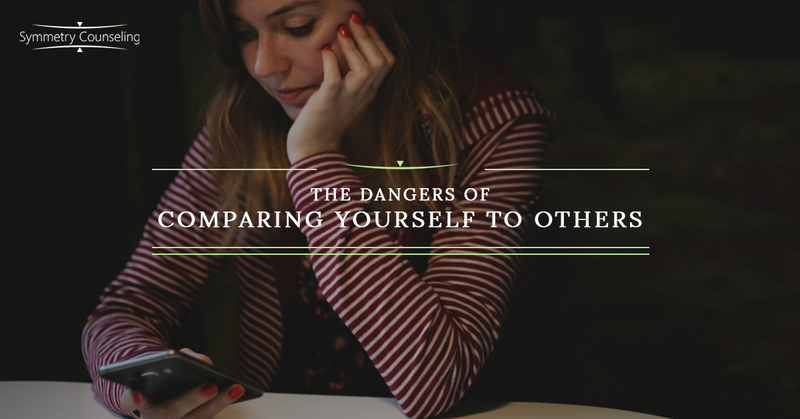 Below are a few dangers of comparing yourself to others and ways to challenge those comparisons. Comparing yourself to others on a regular basis can eventually lead you to feel inadequate and experience symptoms of depression, anxiety, low self-esteem, and strong feelings of worthlessness. Rather than wasting your time, energy, and head space on negative comparisons, try reminding yourself of the positive aspects of your life. What are you grateful for? What have you achieved? What do you love about yourself? Turning inward and thinking more positively about yourself will help buffer the negative effects comparing can have on you. Social media has made it unbelievably easy to edit our lives to make them seem “perfect” and we are all guilty of it. Social media is a platform for us to present to the world what we want them to see, and most of the time, this means it is not the whole picture. We may leave out that we lost a job, broke up with our significant other, or that we are having issues with our immediate family. It is dangerous to compare yourself to the what you see from the outside because it isn’t reality. No one is perfect, therefore, you can’t expect yourself to be. Try reminding yourself that what you are seeing on social media is not their whole picture as you scroll through Instagram, Facebook, Snapchat, etc. If comparing yourself to others is your way of defining your self-worth, you will never win. It is impossible to be better than every person in every way. Try comparing yourself not to others, but to yourself. Who were you in the past? Who do you want to be in the future? What are your personal goals? Considering what you want in your life rather than worrying about what everyone else has. Doing this will help you structure realistic goals and motivate yourself to win in your own life, not everyone else’s. If you are constantly comparing yourself to others and would like some support, it may be useful to connect with a therapist. Contact Symmetry Counseling at 312-578-9990 to set up an appointment with one of our very skilled therapists today!